We love robots here at T3 Towers - whether it be devices that cut your lawn automatically or cute interactive little fellows such as the Wall-E-esque Anki Cosmo that we reported on yesterday, there's something instantly lovable and fascinating about bringing a modern AI into your home. What are home robots capable of right now? Which is why we're so intrigued by the new range of robots from startup firm Ubtech, all of which enable you to control, interact with and customise all from the comfort of your very own smartphone. Simplifying the potentially complicated reality of programming a robot into an easy-to-use app is an ideal way to make robotics far more accessibe to the mainstream consumer. The Alpha 1S, which stands 398mm tall (15.3 inches), is a humanoid creation that enables you to control it by writing different movement commands. And that movement is more than just a shuddering gait - the Alpha 1S has 16 servo joints offering a wide variety of movement combinations and even comes boxed with a set of bespoke gamepads for a quick game of gladiator football! There's also the Jimu robots, who take the same interactive principles of the Alpha 1S and adds in the all important ability to build your own creation from scratch - and it's from here that things get really interesting. The kits are aimed at younger users and teenagers are can be built into almost any shape or form - want to build a robotic house? You got it? Thinking of creating your very own remote controlled car? You can do that to. Anything that places something as fascinating and rewarding as robotics in the hands of young users. "Robot fans used to dream about owning a robot; and with Ubtech it's now a reality," says Jim Barnes, retail director at Thames Distribution, exclusive distributors for Ubtech in the UK and Benelux. 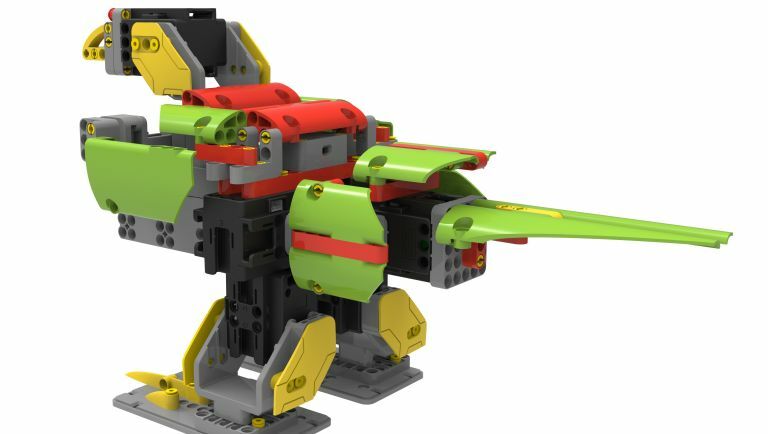 "Owners will be able share their inventions and skills with a global community - and for younger robot fans aged 8 and above they will deliver key robotics learning skills in a fun and engaging way. Sophisticated tech-toys have already been identified as one of the 'hot gifts' for 2016, and there's a robotic exhibition at the Science Museum next year so we're confident Alpha and Jimu will be an enormous success." The Ubtech Alpha 1S retails at £399 and is available from leading retailers such as Toys R Us, Argos, Amazon, Selfridges London and Costco. The Jimu comes in two sizes - the Jimu Explorer (£149.99) which comes with 372 interlocking parts, seven servo motors and everything else you need to power it. The Jimu Inventor (£299) comes with 675 inerlocking parts, 16 servo motors and more.